Wittenberg Door Campus Ministry is a mission of the American Association of Lutheran Churches. We confess that we believe the words of Scripture to be the inspired Word of God and the only infallible rule of faith and practice. We affirm without reservation the doctrines explained in the Book of Concord. We believe that Christ in His Word brings hope and help to hurting people, using his means of grace in Word and Sacrament. Pastor Dave Spotts holds a Bachelor of General Studies (1987) and an MA in Classical Greek (1995) from the University of Missouri, Columbia. He has been involved in various areas of Christian ministry since the mid-1980s and has also taught Greek, Latin, and literature for students from the primary grades through adult since 1995. After some years away from Columbia he returned in 2014. 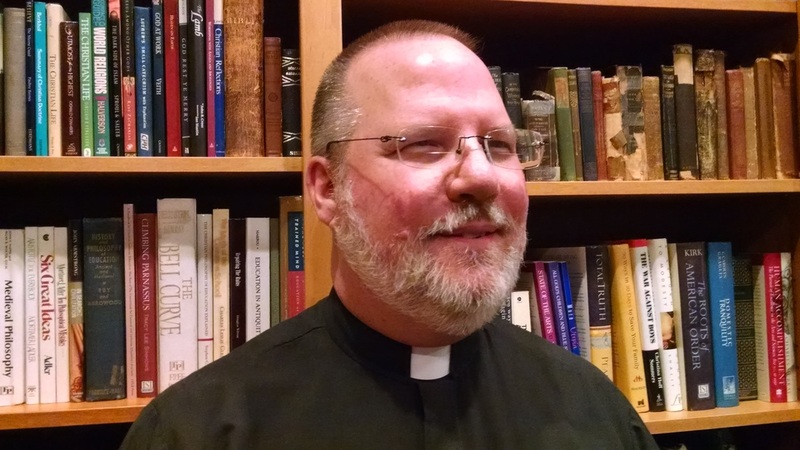 In 2016 he completed a Master of Theological Studies degree from the American Lutheran Theological seminary and was ordained within the American Association of Lutheran Churches.Pastor Spotts is committed to providing deeply Christ-centered and personal pastoral care in educational settings. As well as serving as a campus pastor, he is on faculty of the American Lutheran Theological Seminary. Wittenberg Door Campus Ministry brings the good news of Christ’s perfect life, his death in the place of sinful people, and his role as the one who promises eternal life and hope to our community. Since we look to Christ for hope in this life and in eternity, we try to live as Jesus’ messengers of that good news. Central to this work is having a pastor often present on campus, ready to talk, and, more important, ready to listen. Having a pastor means you have someone who can help you find that hope. You have someone who will pray for your specific troubles, meaningfully and confidentially. You have someone who will walk with you through your trials, not judging you, but bringing God’s words of guidance, guarding your confidentiality, and treating you with respect. When you realize you need God’s forgiveness, the pastor reminds you that Jesus came to earth, suffered, and died for all your failings and that he lives to bring you eternal forgiveness. Wittenberg Door is on campus with a pastor who will help you through those struggles and find your place in the intergenerational life of the local church. Through individual and small group Bible studies we can explore the riches of God’s Word together. Like the people in the 16th century Reformation who gathered to discuss how God’s Word could speak to their lives, we are not afraid to ask the same questions today. Occasionally we have larger gatherings, either in local churches or on campus, for celebrations of historic worship. Through the year there are different days which have been seen as important in the spiritual lives of many generations. We gather to celebrate God’s works in the past and pray for His intervention in our lives and in this world.